In 1871, an employee from Colt by the name of Charles Richards was awarded a patent for converting Colt percussion models to breech loading cartridge revolvers. The Richards cartridge conversion was an instant success. On July 2nd, 1872, William Mason, another employee from Colt, was awarded a patent for an improvement to the Richards model. As percussion parts ran short, the 1860 Richards-Mason barrel was changed from the profile of the earlier percussion model, to the sleek profile found on the 1871-72 Open Top. 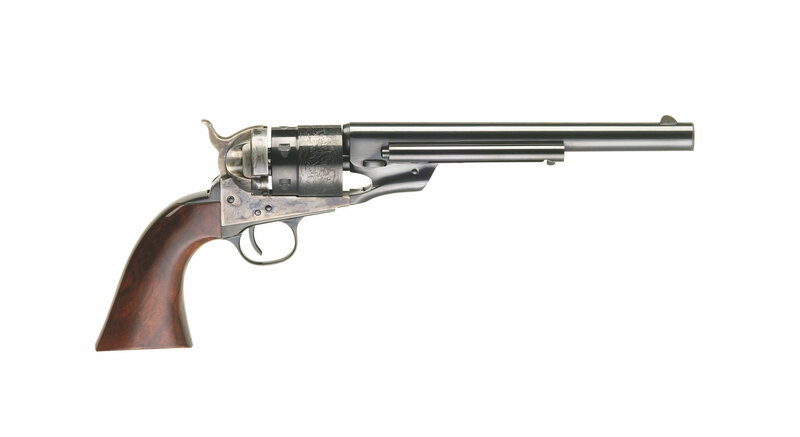 The 1858 New Army improved conversion was introduced by Remington in circa 1873 with special factory installed two piece cylinder, leaving the loading lever and adding an ejector. 5 0927005 1 CYLINDER .38LC. 5 0925005 1 CYLINDER .38SP. 5 0932005 1 CYLINDER .45SCHOF.